Welcome to another papercraft challenge! This week's theme is Happy Days! Well done! You both win three digistamps of your choice from the Handmade Harbour shop. Please email wendy@handmadeharbour.co.uk with your choices and I'll get them to you as soon as possible. You also get to grab the winner's badge for your blog, which you'll find in the left hand sidebar if you scroll down a little. 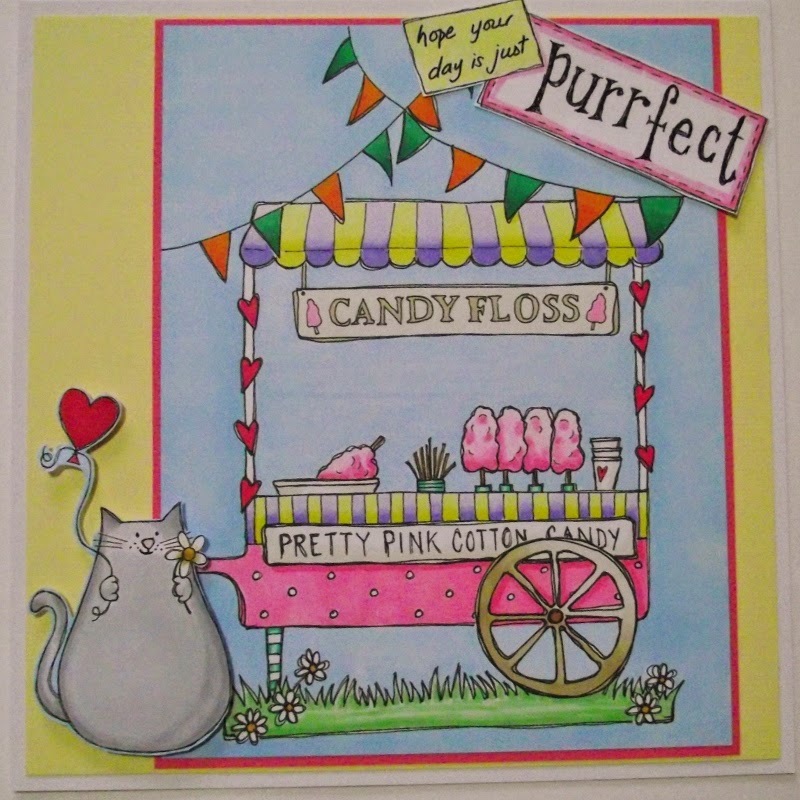 Moving on to the design team creations with our Happy Days theme, I love how Teresa cleverly combined two stamps to create this cat with a candy floss (cotton candy) stall. It conjures up summery, fun days in my head - definitely meets the happy days brief! The candy floss cart digi is one of my favourites and I love seeing it all beautifully coloured here (I really like how Teresa created the 3D effect on the canopy with colour). Paired with the cat digital stamp, it creates quite special card. Oh, now here we have a card after my own heart! I have quite a thing for seaside beach huts and this card just speaks to me of happy days - summer at the seaside! The beach hut digital stamp is just a simple, single beach hut with a little note on the door (life's a beach) - but look how a bit of background and some fabulous colour can really bring it to life! Elina used a homemade embossing paste for the sand - very effective, I think. I love it. Emma at the Sparkly Fairy created something quite simple but very special. I love how just a touch of colour (and maybe glitter, too) on a digital stamp creates a wonderful image - a purrfect card! This might be a papercraft challenge, but we can't leave out fabric creations using digital stamps (digis are perfect for applique designs, especially raw-edge techniques with free machine embroidery). 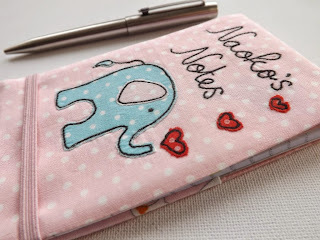 This adorable notebook cover was created by Josie using the elephant and bird digital stamp. What a superb gift this makes! Josie combined it with a tiny scrap of elephant fabric from her stash - the perfect finishing touch! I hope you find something from this post to inspire you this week - whether it's one of the design team's designs or the theme, or colours... whatever, it's always good to find inspiration! If you'd like to join in our challenge this week, it's easy. Please add your link below so we can visit you. We're looking forward to seeing your creations! PS: Handmade Harbour has a brand new Facebook group! Please follow the link if you'd like to join us on Facebook!